Growth on the pumpkin this last week was about half of the previous week. Not sure if it was because of the cool weather if it is the new growth trend. I continue with the fertigation. Each time I mix it up a little. This last changeover I did nitrogen and potassium. Before that I did 7-3-4. I like to go a little lower on the phosphorous. Vine growth has picked up a little on the plant the last two weeks, so the extra nitrogen seems to be working. With 45 days remaining until vine cutting, I need to average 7.5 pounds a day to get where I would call the season a success. Problem is that last week we weren't averaging much more than that. The weather is cool again this week, so I'm not sure I'll see much of a change in the growth pattern. Really wish I had the greenhouse up right now. 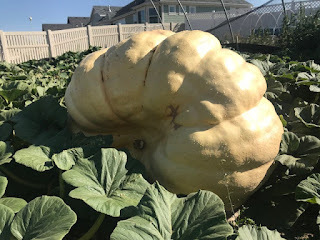 I like the shape of this pumpkin. Barrel shaped is perfect. The 2145 tends to go heavy, so I'm hoping we go that direction, but I've been burned by that thinking before. This is a picture from last week.